PLAN vessels practices strikes against surface ships of an unnamed “enemy” navy. Last week, the Chinese People’s Liberation Army- Navy (PLAN) held a rare live-fire military drill in the western Indian Ocean, according to Chinese state media. 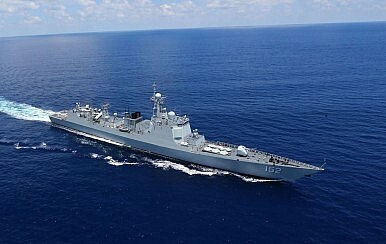 Three PLAN vessels participated in the drill, including the destroyer Changchun, guided-missile frigate Jingzhou, and supply vessel Chaohu. “The drill is aimed at improving the ships’ performance under real combat circumstances,” said Chen Denan, chief of staff of the Chinese fleet, according to Xinhua. The exercise comes as China continues to operationalize its first overseas naval base in Djibouti. Moreover, the exercise comes as India and China remain locked in a tense standoff in the Himalayas. Since mid-June, Indian Army and Chinese People’s Liberation Army troops have held positions on the Dolam plateau, which is disputed by Bhutan, an Indian ally, and China. Chinese naval drills in the Indian Ocean are not new. PLAN vessels have been conducting exercises in these waters for years now and often in conjunction with other navies. In 2013, the U.S. and Chinese navies jointly practiced counter-piracy operations in the Gulf of Aden. For several years now, successive Indian governments have been concerned about the PLAN’s forays into the Indian Ocean. In 2015, in a Chinese defense white paper explicitly noted that the PLAN would “gradually shift its focus from ‘offshore waters defense’ to the combination of ‘offshore waters defense’ with ‘open seas protection,”’and build a combined, multi-functional and efficient marine combat force structure. China has mostly justified its Indian Ocean activities under the aegis of humanitarian assistance/disaster relief and anti-piracy applications. Earlier in 2017, after the first hijacking of a merchant fuel tanker in the Indian Ocean off the coast of Somalia since 2012, the Chinese Navy dispatched vessels to conduct anti-piracy operations. The PLAN’s live-fire drill in the Indian Ocean last week, however, is notable for its presentation as a more conventional military exercise, directed at the vessels of an unnamed “enemy” navy. Video footage appears show a canister for the submarine-launched version of China’s YJ-18 anti-ship cruise missile aboard a Type 093 sub. Is the Chinese Navy Further Along With a Rail Gun Than Previously Thought?China's First Homemade Carrier Could Take to the Seas Later This YearImage Reveals China’s New Nuclear Attack Submarine Can the PLA Navy Make the Indian Ocean Chinese? Is This China's First Homemade Aircraft Carrier?